I was in search of a low-cost VoIP provider to use as a home phone replacement, when I thought about Google Voice. The plus side of Google Voice being that all calls are free within the US, making for a fairly cost-effective phone service. The other factor that I needed to account for was that I needed a solution where 911 service functioned correctly. Google Voice alone will not terminate 911 service, so additional service was required. Historically I’ve only used Google Voice as my voicemail replacement for my cell phone, which has worked very well. I get emails with transcriptions of my voicemails, and my mailbox never fills up. There’s even a Google app on my cell phone that alerts me to the presence of new voicemails and lets me play them back. There is also a feature that can keep me from accidentally dialing someone by prompting me with one last choice before a call is made of making the call with either my phone, or with Google Voice. Some might find that feature/option annoying, but it has saved me from accidentally dialing someone numerous times. I went looking for a device that would allow me to use my regular home phone with Google Voice to make and receive calls. A few quick searches pointed me to Obihai Technologies. 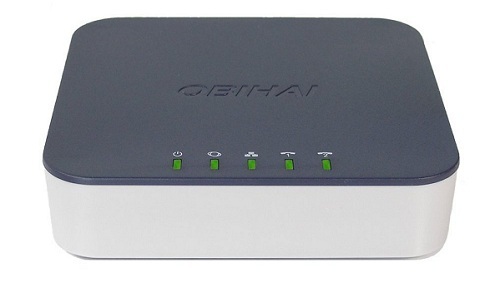 Specifically the: OBi202 VoIP Phone Adapter with Router, 2-Phone Ports, T.38 Fax – Supports: Google Voice & SIP (Unlocked). Which is available from Amazon for only $72 currently. There are some other cheaper models which can do the same base functionality, but i really liked some of the features provided in the 202 model, so I was willing to spend a little more on it. Plug in the “Internet” port to my home LAN. You could use this device as your router, but I already have a custom router doing my NAT and other settings, so I didn’t want to replace it. It works fine from behind my router without the need for forwarding any ports. Plug my analog phone in to the Line 1 port. Pick it up and hear dialtone. 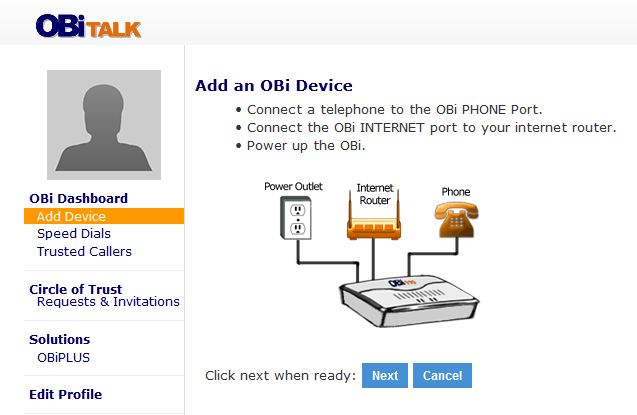 Open my web browser to http://www.obitalk.com/obinet/ and create my account, validate my email address, and login. At this point, you’re all done with the Google Voice configuration, you should be able to make and receive calls with your Google Voice phone number using your regular analog phone. You may wish to tweak your answering machine settings like I did so that we just don’t use that function anymore. I let Google Voice act as my answering machine, and foward the voicemail notices off to an email alias that forwards accordingly. This is all done in the “Voicemail & Text” section of your Google Voice settings. I needed 911 to work from my home phone. After setting up only Google Voice, I tested 911, and it did not work, so I set off in search of a cheap 911 service that I could use. I came across Callcentric, which also happens to be listed in the Service Provider section of the OBiTalk web interface. I was specifically interested in their “Pay Per Call” plan, as I do not want a large monthly fee for something I didn’t intend on using as a primary service. I ordered the Pay Per Call plan from Callcentric, which requires a $5 deposit, and $3 for setting up the 911 service, and only $1.50/mo recurring charge for 911 cost recovery fee. They have a very nice 911 FAQ oulined here. I was given account information upon order completion, which I quickly plugged into the OBiTalk web interface for the “S2” (service provider 2) section, and checked the box that said “Use This Service for Emergency 911 Calls”. About 15 minutes or so later, I received the email notification from Callcentric that my 911 service had completed activation. I re-tested 911, and this time the phone rang, and I was put through to a 911 operator. I explained that I was setting up a new phone service, and I needed to confirm that 911 was functioning properly. She confirmed the name and address that popped up on her screen was correct. The phone number she read back was not a phone number that I knew, and I didn’t see it anywhere in my Callcentric account settings, or my Google Voice account, so I wrote it down. I confirmed that calling that number from my cell phone did indeed ring my phone, so that if 911 called back, it would get through correctly. With the assistance of Obihai, Google Voice, and Callcentric, I now pay nothing for local and long distance phone calls throughout the US. I do pay $1.50/month to make sure that I have a functioning 911 service from my home phone. So far, I’m pretty happy with the results! I’m considering using your post as a model for porting my landline to GVoice as well. How do you like it so far? Any issues with incoming/outgoing calls? I looked into gv911.com, but it is so bare-bones that it seemed a bit sketchy to me. That is solely based on the website, I have no information on the company. But callcentric looked better to me, and I just now set it up as you described and confirmed that a) 911 operators in my area got my correct address, and b) like you said, they showed a different phone number for callback. The operator was not allowed to give me the different number, so I was unable to confirm it as you did, but as long as they are getting my address and I am getting through to them quickly, I have peace of mind. Again, thank you so much for your clear instructions! obitalk & google voice should post links to this. And pay you for it! NOTE: Testing 911 when there is not an emergency can be punishable by law in certain states. We advise you check your local and state laws for more information. If you do choose to test 911, you must immediately inform the emergency response personnel that it is not an emergency and that you are testing your 911 service to make sure it’s working. Thanks for the feedback. I know in my area it’s not illegal to test 911, because I’ve done it several times in other situations. Thanks for sharing!